It's a fine summer day... the sun is shining (yuck), there's not a cloud in the sky (oh darn), and all of the air around you is swirling with a hot wind (ick). It is a perfect summer day, and the water is calling your name. You and your friends decide to host a "Cosplay Pool Party," complete with beautiful costumes, various mermaid tails, and colorful wigs. You can hardly keep from exploding with excitement as you make the preparations for the bash. You and your friends get all dressed up in your finest pool-friendly cosplaying attire, and then get ready to cool off in the water. You hop into the water, and then your wig hops off of your head. NOOOOOOOOOOOOOOOO!!!!! So, let's fix this. At least the part about the wig falling off. I've been wearing wigs for YEARS and used to cosplay practically every day. A few years ago, I decided to take my love of cosplay and costuming (and Devil May Cry) to the water as a Professional Mermaid. I swim in Lake Michigan for YouTube Videos, for my clients, to entertain the locals, and simply for the pleasure of it. However, I do not have the most mermaid-like hair, so I wear a wig when I swim. I know the struggle. How about that makeup in the video!?! Hahaha! My gosh, I looked like a psycho-path!! If you watched the video above, you'll remember that you need to pull back & braid your real hair in order to create a base for your wig to be secured onto. This is a HECK of a lot easier when your hair is not in knots! I'm sure you already have a brush or a comb, but I figured I'd include this in case you don't...? Hahaha! Oh!!! And even if you DO have a brush/comb, you should have a wide-tooth comb for brushing your wig(s). A wide-tooth comb helps de-tangle wigs without pulling out as many wig fibers as a more bristle-dense brush or comb would pull out. I recommend investing in one if you haven't already, since you can use it on your real hair too! I almost never used hair ties before getting into cosplay. I was a "let-your-hair-run-wild" kind of child. However, I do use them (and lose them) quite a bit now. If you want to wear a wig, you really should have a whole bag of these in every nook and cranny of your house... because you will misplace, snap and lose a ton of them. Be sure to have at least a few wig caps on hand. I usually keep one with each wig and have one in my makeup bag as well... in case I forget to bring one to a Professional Mermaid gig. After all... a makeup bag isn't hard to lose. A tiny wig cap gets lost about as easily as my train of thought! 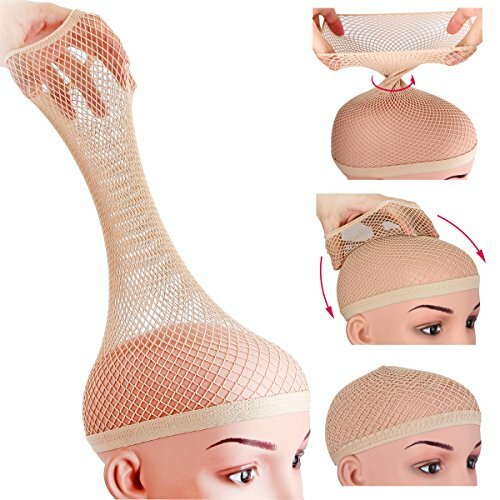 I like the tube-shaped fishnet ones best, since they push up your hair rather than pushing it down (as some do). This keeps it out of your face better. Now you know how to keep your wig on in the water when you swim. You also know where you can find everything you need for swimming in the water with your beautiful mermaid hair. Before I let you leave, I want to point out a few things about wig swimming. As a professional mermaid, it is necessary for me to be a strong swimmer. However, I'll admit that swimming with a wig on my head adds an extra challenge. Having the extra "hair" flowing behind you not only creates extra drag and resistance, but it also can create a dangerous situation if you get your arms tangled up in the wig. Therefore... you need to be careful when swimming in the water with a wig on your head. Even if you ARE a professional mermaid (or other sort of aquatic creature) you CANNOT breathe underwater and can drown. BEFORE YOU SWIM IN THE WATER WITH YOUR WIG, READ THIS!!! Wigs make it increasingly difficult to swim, so you definitely need to play it safe and swim with a buddy. NEVER Swim alone... even if you are an experienced swimmer. I don't want you to drown. If you do choose to swim with a wig in the water, I am not responsible for your decision. I am only giving you my tips on how I swim in the water, but it is up to you to determine whether it is smart or safe for you to get into the water with your wig. You wig is likely to become very "ratty" after a swim or two. Never brush your wig when it is wet!! This will pull the fibers out of it more easily (and they won't grow back! 😉). If you do want to try detangling it, you should wait to brush (with your wide-tooth comb) it until after if has fully dried. I actually suggest having a wig specifically for in-the-water use and one for dry-land purposes. Now you're Ready for a Cosplay Pool Party or Mermaiding Adventure! Like Mermaids? Read these next!